I’m an erratic blogger 🙂 (But you already know that, by now 😉 ) There have been times when, you could read three posts, back to back and then there are times, when you see me once in three months. In the blog-world, consistency is VERY IMPORTANT. I am yet to play by the book ! Over the past 11 years, I have been fortunate enough to have a beautiful relationship with any and all forms of art. I did not restrict myself to water colors or decoupage ~ I am a restless eager soul, I have experienced and enjoyed every craft. What started from card making has just made it way thru to DIY and home décor. Sometimes I find myself going on a spin in a perplexed state when ‘newbies’ ask me what I fancy most. The past 5 months have been remarkably fantastic and have helped me, better define myself. I cannot thank Almighty Allah swt enough for his grace. November and December 2014~ were months dedicated to a dozen or more craft fairs. I love fairs and all the planning, preparation and exhaustion, that comes with it ! January 2015 ~ Gulf News published an article about me and my work ! I was beside myself. January 2015 ~ We completed a 3-Day Art and Craft workshop. February 2015 ~ Organic Café and Foods Supermarket, displayed my handmade greeting cards. February 2015 ~ Aspen House Gifts, got the much needed boost it so anticipated, with several baby shower favors and wedding favors orders. March 2015 – I was requested to be chief guest at the Arts and design Faculty of the American University of Dubai. It was an honor beyond words ! Over the years, I have been blessed to accomplish, all the creative adventures, I dive into, thanks to Allah swt and a lot of patience from my better half and boys. However, there are times, when I question myself, if I am, more of a mixed media artist, or a craft teacher or a carpenter, a card maker or a business woman or a DIY enthusiast. Perhaps, the past 5 months, have given me a glimpse of all who I am. An amalgamation of all these endeavors. Today, Let me share with you alittle about Aspen House Gifts. Dubai is an exceptional city. It is as modern as can be yet, adherently holds to its cultural roots. Arabs, have been known thru out history for their strong traditions and hospitality. 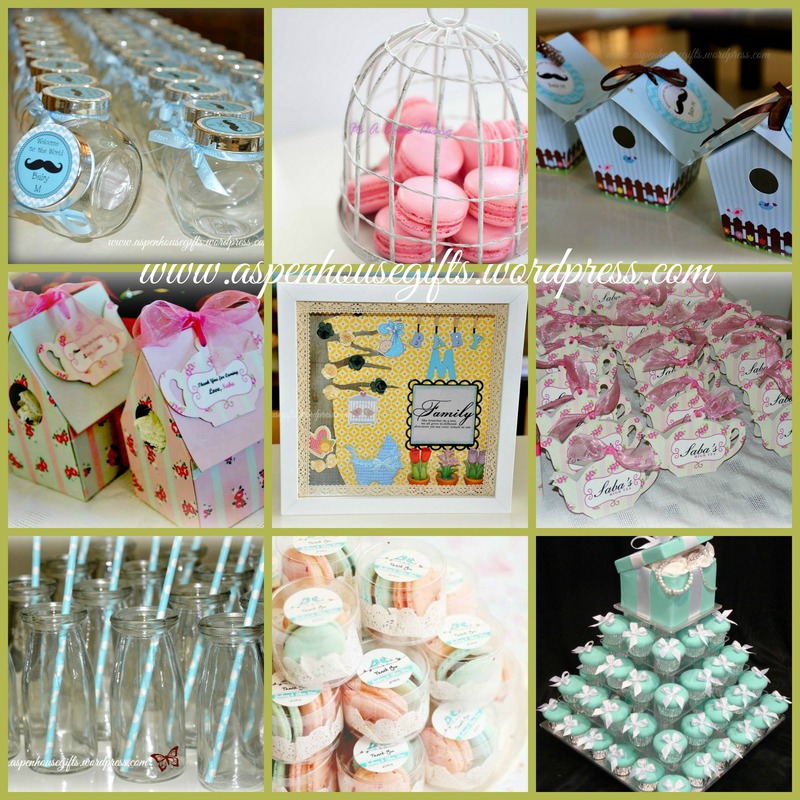 Aspen House Gifts was initiated alittle over a year ago, as a gateway to introducing the latest, most innovative and personalized party favors, party supplies, corporate gifts and one-of-a-kind personalized keepsakes. We personalize party favors and custom-design gifts to suit our clients personality and requirements. I trust you will help spread the word in the blog-world and ‘like’ our facebook page too. Having a creative background gives me an edge in designing, understanding color statements, and packaging and having been in Dubai for 22 years, procuring my supplies is relatively easier for me. Three of the key principles, I adopted from the hospitality industry, for over a decade are, professional attitude, punctuality and exemplary presentation. Elegant, vintage, classic, formal, fun or floral, we can design and personalize it for you . I’m glad that I was fortunate enough to share with you something personal and something professionally about me. Hello ladies ! I hope everyone has been having a week as nice as I have or atleast kinda ! 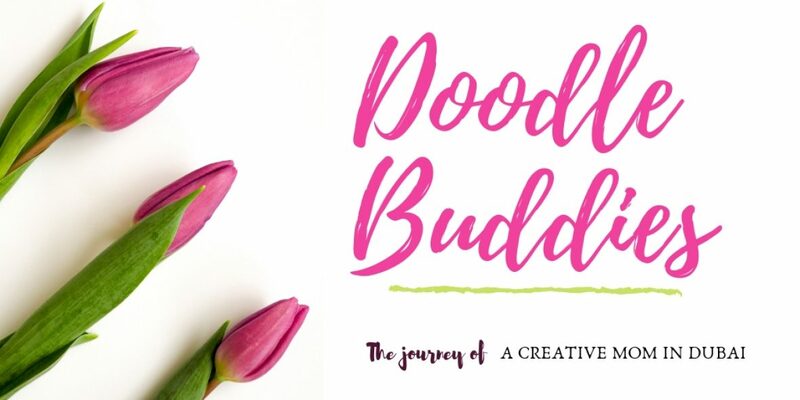 Well, to begin with, I am so glad to see the scores and scores of digi stamps on breast cancer and even more delighted so see so many inspirational cards being designed for this drive. Years back, I had read a book where the main life changing point in the story arises with the diagnosis of breast cancer and how the main character went thru the whole process and delimma of chemotheraphy and its sideeffects etc. I know, having so much reading material around me and awareness, should be pushing me into getting my first mamogram done, but for whatever reason (maybe just worry ) I have been avoiding the appointment. Last year was an exceptionally difficult one and the aftermath of what it bought with it, was also one of the reasons, I was delaying the date. But seeing so many daughters forcing their moms to get a mamo has prompted me too, to seek a gynae. Lets see, maybe somewhere in a fortnight. Okey dokey, glad I got that off my chest, now that I made this commitment on my blog, I better very well, keep up with it, lest one of you asks me in a fortnight, what happened about my date with the gynae ! Here in Dubai, we have a huge mix of cultures and diverse nationalities co-existing together in harmony. Nobody really steps on anyones toes as far as religion or race is considered, except those who bring these pity notions with them from their own countries. Already we have celebrations underway, for the national day celebrations, Festival of Eid early november, Diwali, the hindu celebration, Halloween’s around the corner and ofcourse Christmas. One of the reasons, why all these occasions play any significance in my household is coz with these occasions comes a huge demand for gift baskets, party favors, school favors and diwali gift baskets. This is the busiest part of the year for me, what with all these orders and delieveries ! This first post is about a baby shower, one of my friend’s collegue has requested make for her sister in law who is expecting a baby in a couple of weeks. She did not want the traditional colors of pink or blue and she has quite a thing for purses, so I decided to take it from there. I have made purses/bags using the main colors as orange and green. 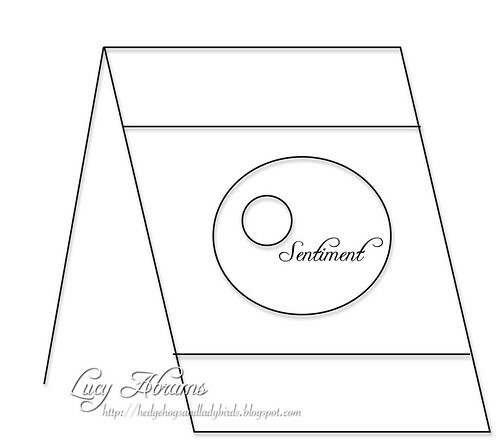 The little baby with the blankie is a digi stamp and so is the sentiment circle. 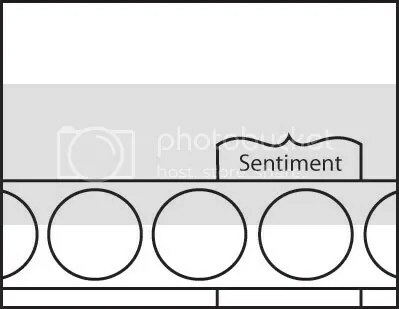 Although there are scores of templates out there on the net, I prefer to use my own template which can be scaled up or down, subject to the requirement. Please do leave a note/comment telling me how you found this baby shower purse. I’d really feel encouraged and appreciate it. Thank you so much for visiting me today. I’m so glad your here and I’d be happier if you could leave a note to tell me how you found my baby shower. Have a fantastic day !! All pieces of art have a story to tell. They have shared something special with the artist who created it. They have taken a part of his own reflection, his belief and his passion. Some pieces are accidental while some pieces are discussed and expected to be spontaneously spectacular. While I was having the craft show, I wanted to make a few demo sample pieces of plaque works for people to be able to visualize how and where they can use my baby embellishments. Some of us are creatively challenged although I feel each one of us can create at some point or the other, with a little inspiration and alittle skill or taught techniques, it can be achieved easily. This is a large piece of Plaster of Paris from the ceiling !!! Imagine that !!!!! With foil on one side and white embossed sheet on the other. I hope you got what I’m talking about ! What a joy such recycling projects are ! Long story short, I have a beautiful piece displaying how a mother can never tier of adoring all the tiny pieces of baby clothing and dresses, even in this miniature form. The two clothespin on the lower bottom right side are amazingly cute animals where a note or an envelope can be clipped to. Lots of diecuts have been used in shades of pink and blue, brown and patches of green too. Now although this was supposed to be purely a display piece, one of my customers has been so insistent to buy it. Although I tried to put her off, what with the recycle issue with it, but she really seems to have a thing for this piece inspite of explaining it to her. She has called twice already !! So anyways, this piece will stay with me for only 2 days more and then its going to adorn the mantle or shelf or wall in one very happy little girls home. Amongst all the embellishments, I love the crocket bath robe the most, Its like so awesomely cute and beautifully made. 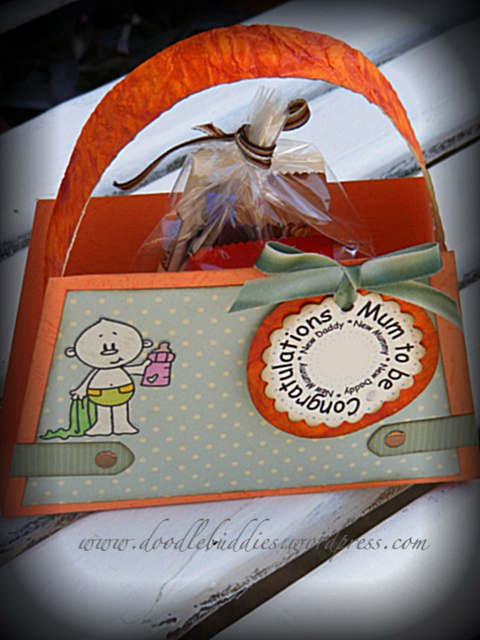 And how cute is that little tag about the tiny feet in the crochet basket !! Please do tell me which one of the gorgeous embellishments you liked the most. Enjoy the plaque. One Stitch At A Time – Use a Digi ~ the sentiment on the tag is a digi stamp. Paper Creator’s Crafts 2W, SIO, 3E. Special Occasion~baby’s birth is most special. 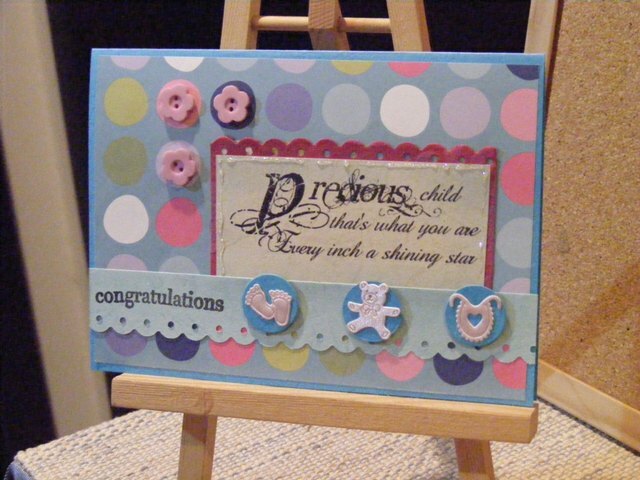 Clearly Inspired – 2W, 1E, SIO – Punches, Die Cuts or Cut Outs. Stamp Something – Use a digi. The sentiment on the tag is a digi. Totally Papercrafts: diecut, embossing, ribbon. AiFactory – 1E, SIO – Use your favourite embellishment. the hangers are my favorite. Paper Play – 2E – Anything but a card. Shelly’s Images – SIO – Recycle/reuse. its a completed recycled project. Southern Girls – 2W, 1E – Childhood memories ~ all those tiny dresses open the flood gate of my boy’s baby days. Here is the list of linking parties I am joining. I am using this stamp is for the first time and I do hope I have done justice to his coloring which I did not want to use too many on this little bunny !What can I say, they have such cutie stamps and some so hilariously cute ones. I have used pink lazer lace sticker here. Some very cute buttons and some super cute embellishments of bibs, umbrellas and baby bottles too. I wanted to keep the card universal in nature as in, it could be given on the birth of a girl or boy. 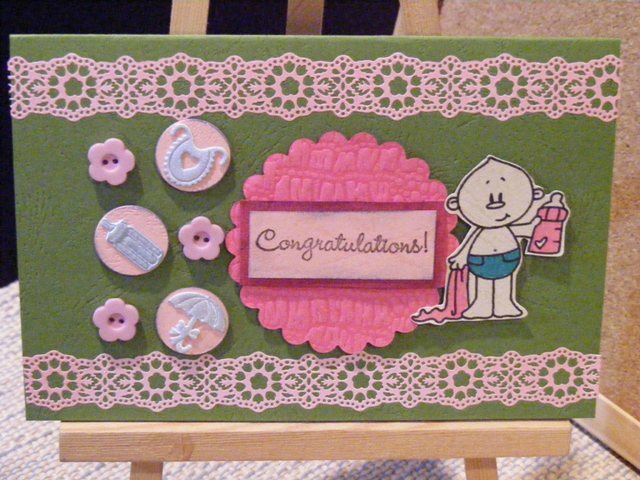 The pink flower in the center is embossed paper, and the “congratulations’ is the only stamped image there is. I really had fun creating this card, in green, pink and blue !! Very unusual for me but nevertheless, I feel it looks cute ! Right until valentines, I am going to try and create more cards, tags, altered art on love, baby arrivals, get well soon and congratulations. It is a deliberate effort becoz I realized these are the cards, I miss out most on. I do hope to hear from you soon. Its been quite some time since I made one of those baby cards that I enjoy making so much so much. Probably the most important period of a woman’s life. And nothing compares to what she feels when she holds those tiny feet in her hands for the very first time. But you all know that already any ways. So I thought a bright pink and blue in various shades would do some justice to the very cute tiny baby embellishments I have. Today I got my first comment on this blog and it really had me excieted. I always wonder when I see my readometer, who are all those thousands of viewers who have checked out my blog ! And finally to receive this comment just made my day. So thank you to you carole. Carole herself makes awesome cards, do check her site out too. Meanwhile heres a card I designed this morning. I think amongst all the techniques in card making, decorating a card with embellishments and using the nestabilities dies is what I love the most. Although I like rubberstamping and use it pretty often, I am not completly stuck up on them. Heres an example. Hope you guys like it.